The original Comic Life made a splash with its Mac debut seven years ago, by taking a specific task—turning your photos into comic book-style layouts—and perfectly balancing ease of use with a sense of fun. The follow-up from developer Plasq continues that fine tradition while adding some welcome features to the mix. 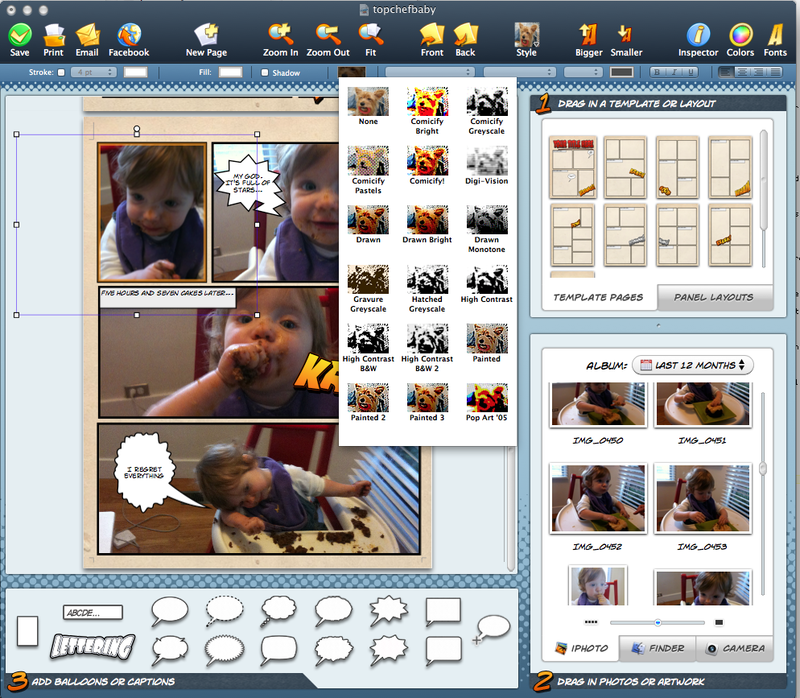 Previous users will feel right at home in Comic Life 2 (Mac App Store link). So will newcomers to this specialized image editing application. That’s a testament to how easy it is to get started with the app, as well as how simple Plasq makes it to discover Comic Life 2’s many tools. 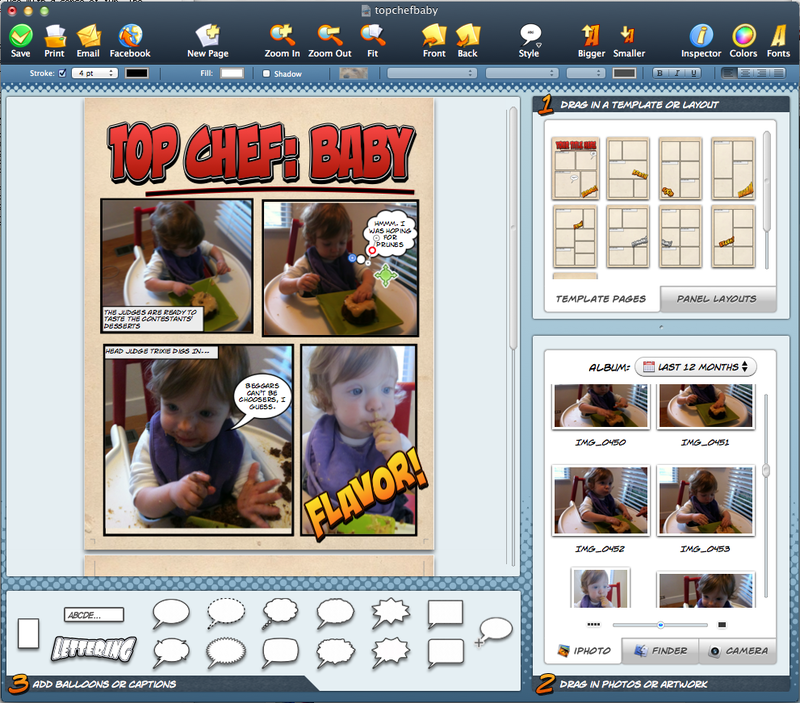 Getting started with Comic Life 2 is as simple as choosing a template—the application supplies 25 different themes, along with a couple of blank templates if you’d prefer to forge your own path. Comic Life’s main window includes a photo picker that makes it easy to drag images out of your iPhoto library or track them down through the Finder; a Camera option even lets you snap pictures with your Mac’s built-in-camera for photos on the fly. From there, it’s simply a matter of dragging in different speech bubbles and stylized text to give your final project the look you desire. There’s an incredible amount of depth in those tools as well. Add a speech bubble or thought balloon, and you can manipulate the size of the balloon, where it appears in your picture, and even the swoop and angle of the bubbles and lines leading from the speech bubble to the person’s mouth. You can alter the size and font of the text within the bubble—Comic Life offers a host of comic-friendly fonts—and you can bend and twist free-floating lettering to your liking. You can even add filters to your photos to give them a distinctive look as well. There’s plenty to explore and the effects are so easy to adjust, even an artistically-challenged person like myself can whip up a pretty decent layout. app to give your any holiday letters to family and friends a memorable look, and I can cite at least a few grandparents who’ve appreciated the Comic Life-built photo montages I’ve assembled for them. Included seasonal and travel templates also make the app a good alternative for presenting your vacation photos in a distinctive way. In addition to print and email options, Comic Life 2 adds Facebook integration. The integrated uploader exports your Comic Life projects to the social networking service where they appear as a photo album. 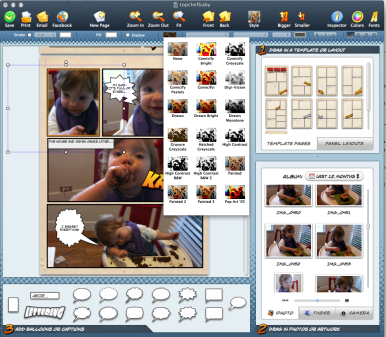 You don’t need to spend a lot of time getting up to speed with Comic Life 2’s many features. But you will end up spending a lot of time within the app because it’s such a pleasure to use.